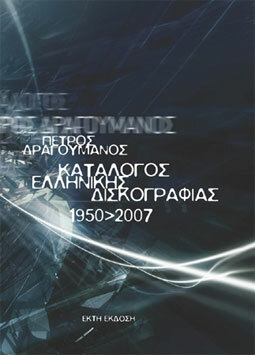 DVD GREEK DISCOGRAPHY 1950 - 2009 + HUGE BOOK 1950 - 2007 CONTAINS 32.354 GREEK LPs, CDs ��� CD singles RELEASED BETWEEN 1950 AND DECEMBER 2008. � 12.282 ARTISTS WITH THEIR BIO, PHOTOS AND FULL DISCOGRAPHY � 32.354 RECORDS (LPs, CDs, CD singles) WITH ARTISTS, COMPOSERS, ALBUM COVERS AND TRACK LISTS. IN GREEK LANGUAGE.